Balenciaga: Shaping Fashion” at the Victoria & Albert Museum, London. 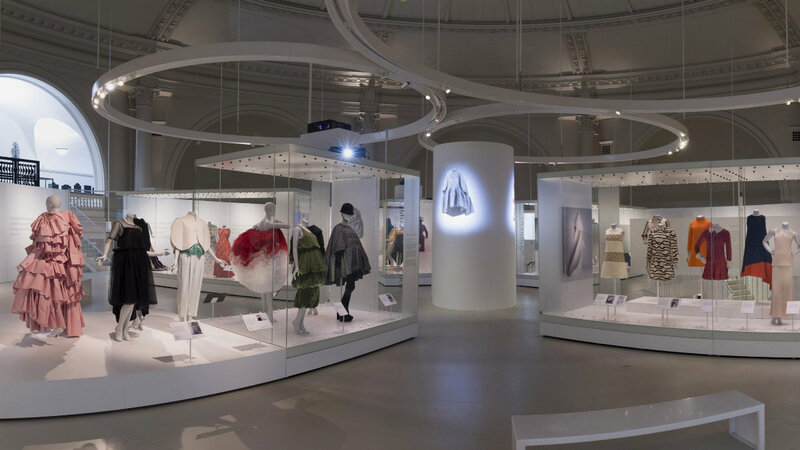 Examples of Balenciaga’s elegant sculptural creations. Balenciaga at work and the museum’s X-ray of gown. Next month, more than 100 paper doll enthusiasts will gather in Philadelphia to attend the annual Convention, this year chaired by Linda Ocasio and Valerie Keller. As always, there will be good times meeting old friends, buying and trading paper dolls, enjoying entertaining and informative workshops and presentations. 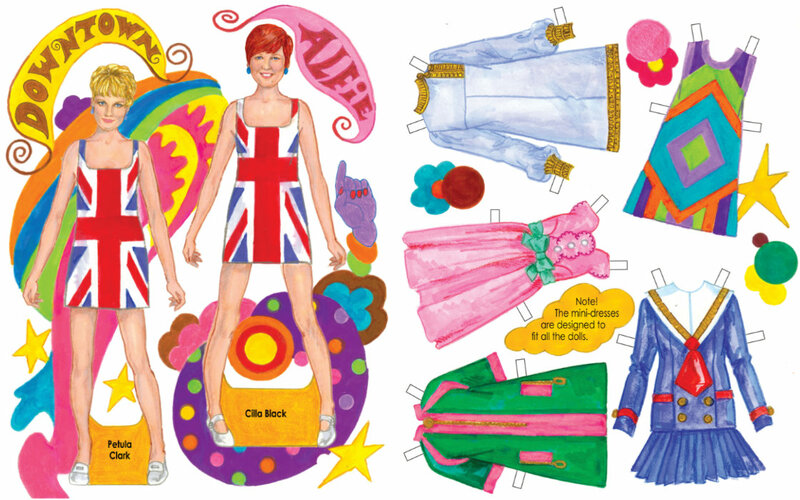 Of course, there will be souvenir paper dolls referencing the convention’s “Swinging ‘60s” theme. I’ll be presenting the story of how I went from living in Ashtabula, Ohio to London in the ‘60s, a reminder of the fashions and personalities that made London swing. Here’s a sneak preview of the souvenir book I created that will be given to attendees along with many other paper doll souvenirs. For more information on the convention and souvenirs, visit Linda Ocasio's blog, thepapercollector.blogspot.com. Sample Preview of my 6-page convention paper doll souvenir booklet. When I was researching the Queen’s wardrobe for my forthcoming Royal paper doll book for Paper Studio Press, I wanted to include some more “everyday casual” items. (Not that the Queen ever would appear as dressed-down as an average American.) I decided to include a quilted jacket, a fitted tweed hacking jacket and a tartan skirt. I found that there is an official royal tartan listed in the Scottish Register of Tartans. It is named “Balmoral” after the royal residence in Scotland, woven with black and white twisted yarn suggesting the local rough hewn granite. It was designed in 1853 by Queen Victoria’s consort, Prince Albert and is restricted. It may be worn only by the Queen and members of the royal family with Her Majesty’s permission. The only other person permitted to wear the Balmoral tartan is the Queen’s personal bagpiper. I decided that for the paper doll, I would suggest the tartan, but not attempt to replicate the protected design. Even so, drawing and painting a complicated plaid pattern is no easy task because of the pleats hiding parts of the grid. 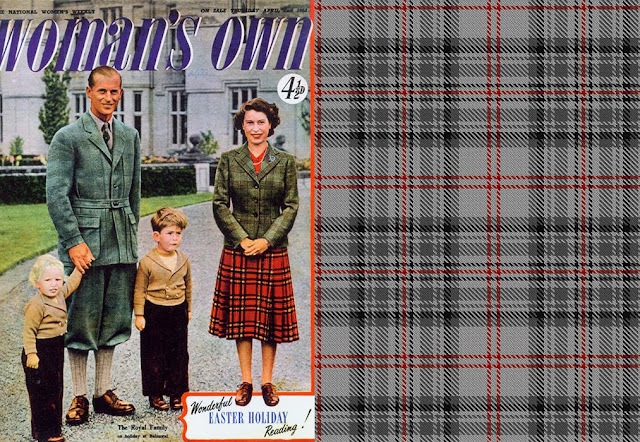 The Royal Family wears the restricted Balmoral tartan. Working on the paper doll’s tartan kilt. I enjoy assisting Jenny Taliadoros with paper doll projects. One such was a delightful challenge that began with a fantastic item Jenny received from Alina Kolluri, a lovely young woman who expertly “test cuts” paper doll books published by Paper Studio Press. Alina presented Jenny with a beautiful Deco Dollies scrap book that held many, many, many paper dolls, each with an extensive wardrobe, all in artist Alina’s charming style. Jenny was understandably entranced and wanted to find a way to turn the scrapbook paper dolls into an eight-page book for publication. Together, we came up with an Art Deco cover that suited the personalities of the dolls and their 1920s/1930s fashions. I sorted the hundreds of garments and accessories into eight themes, then down-sized to the number of fashions that could fit per page, a very challenging editing job. This delightful book will be out later this year. Alina was pleased with the result and surprised me with a marvelous “Thank you” gift, a one-of-a-kind tote bag printed with a collage of 23 paper dolls wearing outfits from two of my recent books. Of course, Alina arranged special permission from Paper Studio Press for this once-only use of the copyrighted artwork. What a wonderful gesture… thank you, Alina! 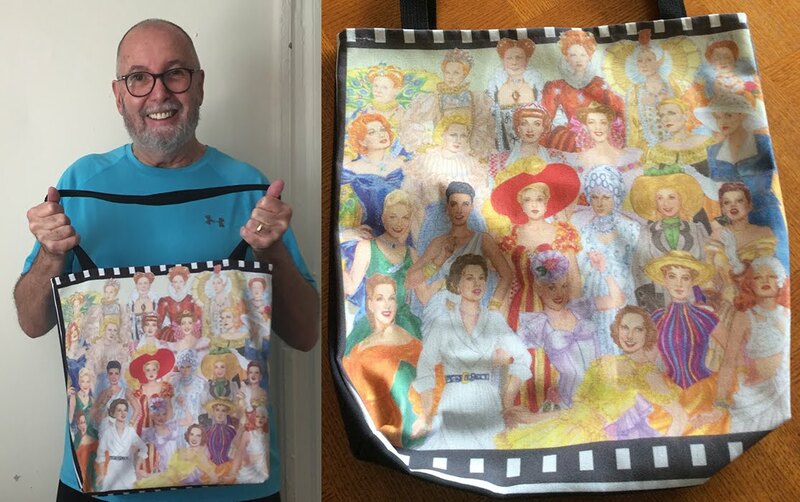 Lucky me with Alina Kolluri's terrific one-of-kind tote bag. 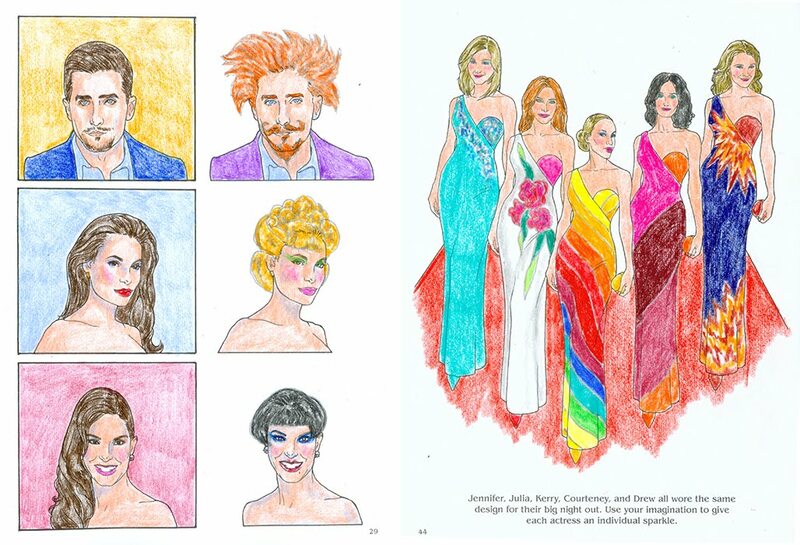 This month’s coloring book was even more creative than usual. Bruce Patrick’s Jones’ fabulous talent and sense of humor come together in his Celebrity Scenes, Fun and Games with Hollywood Stars coloring and activity book. Page after page of top stars are ready to color or to doodle, to mix and match, to play games and be creative. I especially enjoyed creating new gowns and hair-dos for some stars. What makes this 46-page book so special is Bruce’s extraordinary ability to draw such perfect likenesses of scores of top stars, female and male, from Angelina Jolie to Zac Efron. This unusual book provides hours of creative fun and is available for purchase from paperdollreview.com. 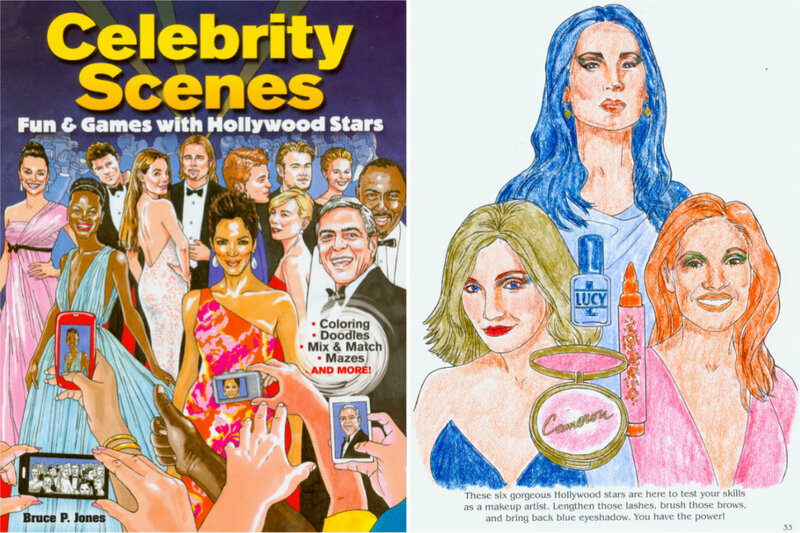 Celebrity Scenes cover and make-up page. Celebrity hair-do and gown make-over pages. 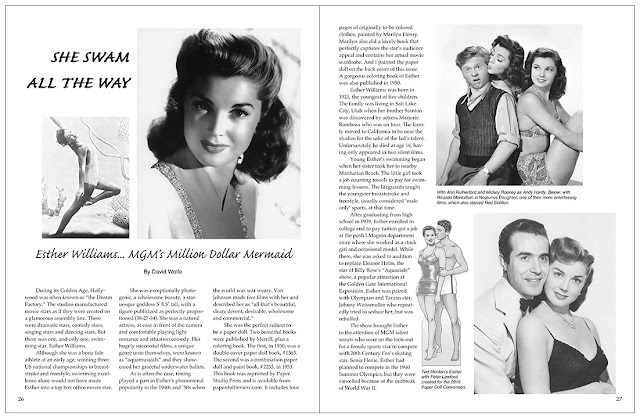 Esther Williams - New on paperdollywood.com! I had fun recently writing about the life and career of the splashiest movie star ever for the upcoming Paperdoll Review magazine, Issue 67. Esther Williams! Her extensive article ran with lots of gorgeous photos including some gems from the private collection of movie expert and paperdoll artist, Marilyn Henry. You’re invited to visit paperdollywood.com where the Esther Williams' bio joins the many star bios that I have written over the years.